Begin one day of your tour at Union Station; DC tour departs at 9:30am, Virginia tour departs at 11:30am. You may decide which tour to do first; you don't even have to take the tours on consecutive days. Please note that tours operate Tuesday through Saturday only. Tours do not need to be taken on consecutive days.Arlington Cemetery and US MemorialsYou will feel like a VIP as you are escorted around the city in a luxury motor coach. Our guides will enthrall you with colorful stories from the past and little known facts about all the monuments, statues, buildings and locations in and around DC, as well as answer any questions you might have. 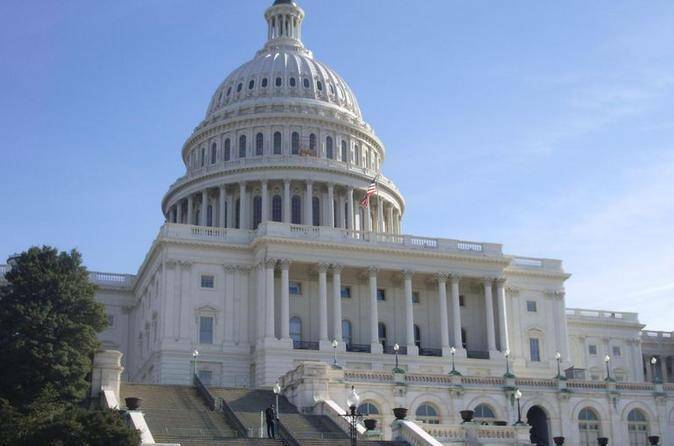 Receive a guided tour of the U.S. Capitol Building and stop for a photo opportunity outside the White House. The White House Visitor Center will allow you to see and feel what the interior of the actual White House looks like, without interrupting President Trump's schedule. Experience the beauty and grandeur of the World War II Memorial.Mount Vernon and Afternoon Tram TourAt 11:30a, travel by coach from Union Station to George Washington's beloved plantation, Mount Vernon. Tour the mansion and the Donald W. Reynolds Museum and Education Center. You'll want to pay your respects to the soldiers, statesmen and other American heroes buried at Arlington National Cemetery. Visit the Tomb of the Unknowns and be moved as members of the U.S Third Infantry perform the Changing of the Guard ceremony. The lectured Tram ride through Arlington National Cemetery will also stop at the Kennedy Gravesite. The Grand Tour would not be complete without visits to the Reflecting Pool, the Women in Military Service for America Memorial, the Lincoln Memorial, the Vietnam Memorial, and the Korean Memorial, and MORE!Finish your day with another coach tour focusing on Washington DC memorials. Drive by the Pentagon and the Jefferson Memorial, Lincoln Memorial, Marine Corps War Memorial (Iwo Jima), Korean War Memorial and Vietnam Veterans Memorial. The motorcoach departs Mount Vernon at 3:00pm. Tour operates Tuesday through Saturday. You do not have to take tours on consecutive days.